We had just finished a short and pleasant ride to a local coffee shop and were returning home. As we crested a short hill, an impatient motorist passed us and forced an oncoming car to the shoulder. The motorist who had been forced from the road rolled down his window and motioned at us. Ah, there it was, one of those buzzkill interactions you sometimes have with motorists. That unsafe pass was our fault, in his thinking, because we should have been riding on the sidewalk. Central to our friend’s argument is the belief that our roads are wholly funded by a tax on gasoline and diesel fuel. Since cyclists are not buying gasoline to pay for all that asphalt, the argument goes, they should be banned from the road. Before we strip down our friend’s argument, let’s settle something right up front: you, me and the rest of the un-showered masses have a RIGHT to use public roads. That right is grounded in Roman property laws from the second century BC. Those Romans really knew a thing or two about road use – last summer I biked across a Roman bridge, Pont Julien, which has been in continuous use since 3 BC! You’ll sometimes hear people say the use of the road is a privilege, not a right. Those people are confusing the right to use our public roads with the privilege of driving a motor vehicle. You earn the privilege of driving your Chevy along Route 66 by passing a driving test and receiving a valid driver’s license. Disobey enough traffic laws, bub, and you’ll be parking that Chevy in the garage for a while. But even when that license privilege is revoked, your right to use public roads remains. Pump up the tires on that neglected Schwinn Traveler and you’re good to go. But I digress. We’re here to talk about taxes. What about this idea that bikers are not entitled to use the roads because they don’t pay gas taxes? The Atlantic article is largely based on a white paper, Who Pays for Roads?, published by U.S. PIRG’s Education Fund. The PIRG study “exposes the myth that drivers are covering what they’re using.” The reality is that the amount motorists pay in gas taxes covers less than half of what it takes to maintain our current roads and build new ones, according to the article. Plain and simple, the gas tax doesn’t foot the bill, or even half the bill, for the roads we all use. In fact, the amount of money generated by the gas tax has lagged as a funding source as cars have gotten more fuel-efficient. So where is the rest of the money coming from for all that asphalt? “The resulting shortfall is made up from other sources of tax revenue at the state and local levels, generated by drivers and non-drivers alike,” the Atlantic article notes. The typical household pays about $1,100 every year, over and above gas taxes and other fees, to subsidize those roads. My two-car family is paying an indirect cost of $1,100 a year for roads – on top of the money we pay directly for gasoline, property taxes on two vehicles, and vehicle registration fees. The Atlantic article advocates for making road subsidies more visible so that motorists come to appreciate the real cost of driving. “If roads were priced to recover even the cost of maintenance, driving would be noticeably more expensive, and people would have much stronger incentives to drive less, and to use other forms of transportation, such as transit and cycling,” the author states. Almost all pavement damage tends to be caused by trucks and buses because, for example, the rear axle of a typical 13-ton trailer causes over 1000 times as much pavement damage as that of a car. 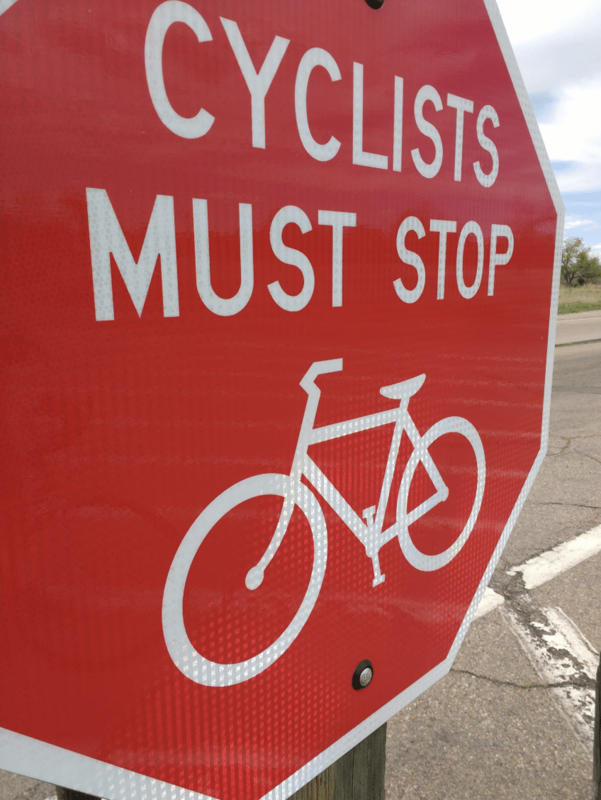 Bikes are not discussed in that article, but it’s safe to assume a bicycle causes little or no damage to the average asphalt or concrete road — other than the playful skid marks left by the coaster brake crowd. Don’t hold your breath waiting for vehicle-mile fees. The motoring public is too accustomed to the free way. The fee way doesn’t stand a chance. I don’t think I’ll ever win an argument with that motorist who rolled down his window, nor do I have any desire to engage drivers in roadside debates. I’d rather just wave and continue on my way, secure in the knowledge that I have a right to our public roads – and that I’m paying my fair share for them.